EnergyTrend, a research division of TrendForce has projected that cylindrical Lithium-battery price will decline by about 2.8% in 4Q13. Currently, battery cells are segmented by capacity, which can be divided into three types – high, medium, and low capacity. 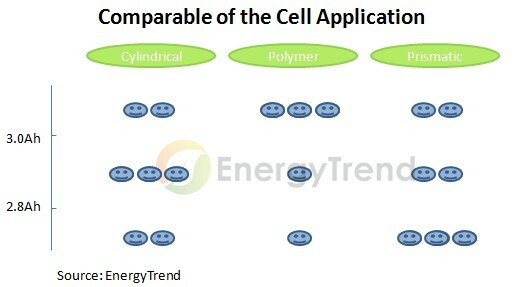 Although >3.0Ah high capacity cells can be used on cylindrical batteries, the cost threshold of cylindrical batteries is too high and they would be difficult to meet the lightweight requirements of high-end products. Thus, polymer batteries are more suitable for high-end products. As for 2.8~3.0Ah medium-high capacity cells, their production technology is quite similar to that of 2.2Ah. Also, the unit price is not that different from 2.2Ah, and their volumes can be reduced efficiently. Therefore, 2.8~3.0Ah is the best choice for middle-end products to maintain cost and reduce volume. Last but not least, standard batteries are more suitable for low-end products which are more sensitive to cost. Due to standard battery’s larger market share, it’s more likely to go into mass production. But in terms of cost advantage, cylindrical battery seems to be the best choice in the short run. EnergyTrend indicates that in terms of price, cylindrical battery reflects a downtrend from long-term perspective. In 4Q13, the number of battery cells used in a laptop has been reduced from 6 pieces to 3~4 pieces. Under the circumstance where endurance remains the same, the choosing of high capacity cells will definitely become a trend. Hence, cell manufacturers have started to produce more high capacity cells following the increased demand and appropriate adjustment on the production line. It in turn caused 2.8~3.0Ah battery cell price to decrease by 2.8% QoQ. The supply and demand is relatively balanced for polymer batteries while the price is also showing steady decline (-2% QoQ). The price drop is likely to be caused by routine equipment amortization. It’s estimated that the market share of polymer batteries will grow steadily due to the increased popularity of portable products. However, apart from Apple, polymer battery applications will still be limited to high-end products. So far, the biggest challenge for polymer batteries will be how to maintain stable supply while solving the inventory issues caused by customization.